Sepsis is an infection affecting the entire body that can be cured when treated properly and promptly but can lead to severe illness, disability, and death when left untreated. Chemicals released into the blood to fight infection trigger widespread inflammation. This inflammation progressively interferes with organ function. It the sepsis is allowed to proceed unchecked, it will result in organ damage and death. It develops from more common infections such as UTI's or pneumonia. Sepsis goes into the bloodstream, attacks the body's organs, and causes them to shut down. The body attempts to compensate this with a rapid heartbeat, causing the blood pressure to decrease. The kidneys then begin to fail, and antibiotics can be used to help reverse this chain of effects but they must be administered quickly. It does not take a special doctor to suspect and test for sepsis. The timely recognition of sepsis and the appropriate treatment for it is taught to all medical students and resident physicians, irrespective of their ultimate specialty training. The universal education about sepsis is because it is a fairly common disorder, particularly in emergency room and primary care settings. The minimum standard of care is for practicing physicians to have the ability to recognize and treat sepsis. Our lawyers see both the failure to recognize and failure to treat cases. Many doctors commit medical malpractice because they do not see the signs of sepsis that are there to be seen. The second cause of sepsis malpractice claims is that while the doctor recognizes the possibility of sepsis, the doctor fails to attack the concern with a diligent and aggressive search to rule out bacterial infection. If you or a loved one has been harmed or killed because of a failure to treat sepsis, get in touch with us today. Call 800-553-8082 or get a free online consultation. Learn whether you can sue for the harm that has been done. Symptoms of sepsis usually include fever, tachycardia (rapid heartbeat, over 90-100 times per minute), tachypneic (rapid breathing), an elevated white blood cell count, muscular aches, lethargy, and weakness. Normally, a combination of two or more of these symptoms is an indicator of sepsis. To diagnose sepsis in its early stages, doctors look for an ill-appearing patient, with a temperature, with abnormal vital signs and high or low blood pressure. An indication of severe sepsis is the above-mentioned symptoms, accompanied by organ dysfunction. This can lead to septic shock if not treated immediately. Once a diagnosis of sepsis occurs, it is imperative to receive fast treatment. An important prognostic indicator for patients with MRSA infection and sepsis is the time from the onset of signs and symptoms of infection to treatment. Left untreated, infections of the skin and underlying soft tissues can progress locally and may also disseminate systemically thru the bloodstream to multiple organs. Accordingly, signs of sepsis merit an emergency situation, requiring to recognize and be conscious of the signs. Most medical malpractice cases stem from a failure to recognize the signs of infection and initiate appropriate treatment. Patients with sepsis and septic shock require aggressive management. This typically includes including antibiotic therapy, fluids hemodynamic support, vasopressors, and sometimes surgical removal of the infection. Opiate narcotics and sedatives are ineffective in treating the type of bacterial infection that causes sepsis. The consequences of failure to treat sepsis promptly are severe. Patients often go into septic shock, have organ failure, and then die. Below are some examples of jury verdicts and settlements in Maryland and other states that deal with sepsis cases. These can be used as a first look at what is involved in the failure to diagnose or treat sepsis properly claims, and to see what a case could be worth. Remember that there are many different variables involved in each case, so it can be difficult to predict the value of a claim based on these past settlements and verdicts. But these do provide some insight generally into the value of these cases. 2016, Pennsylvania: $475,000 Settlement. A male resident of a nursing home is receiving daily care from August 2009 - November 2010. In late September 2010, his health begins deteriorating and he begins showing bruising and cuts as a result of falls, decreased urine output, weight loss, and no interest in eating. He then develops a fever, and is diagnosed with a UTI and placed on Cipro. Although he has pressure ulcers developing and his mental condition is worsening, he is not taken from the nursing home to the hospital for two more days. After admission, he is diagnosed with sepsis and treated with IV antibiotics. But he dies shortly after. Plaintiff argues that the nursing home failed to hire and adequately train their staff, and failed to complete daily required records which could have prevented patients from receiving severe and permanent injuries. Further, he is arguing that the nursing home failed to provide adequate and proper healthcare standards. The matter settled before trial for $475,000. 2015, California: $175,000 Settlement. An adult female suffers from a UTI and arrives at the emergency room. The doctor orders tests consistent with normal UTI procedures, which show a serious infection. The patient is never told of these results or instructed to return for treatment. She dies from sepsis eight days later and alleges that the hospital failed to properly assess and treat her condition. The case settled before trial for $175,000. 2015, Pennsylvania: $500,000 Verdict. A 42-year old male has received surgery and was transferred to a rehabilitation center, with a medical history including chronic obstructive pulmonary disease, asthma, and diabetes, and was to receive antibiotics to prevent an infection. He is not given these antibiotics, and develops a fever and fluctuating oxygen levels. These signs lead the physician to call his doctor, who orders that he takes Tylenol instead of examining him. After a few days without change, the doctor orders a panel to be done, showing the patient to be in respiratory distress. He is ordered to the ER but dies the following day from sepsis as a result of his respiratory distress. Plaintiffs argue that the hospital staff and doctor were negligent in assessing the patient for signs of infection or sepsis and allowing him to feel suffocated for 11 hours. The jury agrees, awarding $500,000. 2014, Massachusetts: $4,650,000 Settlement. A minor plaintiff arrives at the hospital with complaints of lethargy, incontinence, right leg pain, and is unresponsive. After an evaluation by the doctor's, she is diagnosed with tachycardia, tachypnea, and altered mental status and is admitted for observation. The symptoms worsen, and she is moved to the ICU, without immediate administration of antibiotics or intubation. She is suffering from sepsis, as a result of a MRSA infection, and now has a permanent brain injury as a result of the failure to timely diagnose and treat the sepsis. The doctors argue that there was no reason to think she was suffering from sepsis when she arrived. But the settled for $4,650,000 so obviously that defense was not too vigorous. 2013, Maryland, Prince George's County: $9,500,000 Verdict. A two-week-old infant has cerebral palsy, moderate mental retardation with speech and learning deficits, and a seizure disorder as the result of a delay in a diagnosis of sepsis and meningitis after a visit to the emergency room at Laurel Regional Hospital in Prince George's County. While at the ER, the nurse fails to report the abnormal blood culture results to the physician, and the results are not reviewed nor was a report of them sent to the patient's regular pediatrician. The plaintiff claims the nurse violated the standard of care by failing to properly document her response to the abnormal lab results, failing to act upon receiving the results and failing to provide the patient's pediatrician with the information. The plaintiff also claims the hospital is liable, as it is in charge of the nurse. A jury finds the nurse to be negligent and the hospital, through its employee, to be in breach of an adequate standard of care, resulting in injury to the plaintiff. The plaintiff was awarded $9,500,000. 2013, New Mexico: $2,250,000 Verdict. A 20-year old woman is in the hospital for a few weeks due to pancreatitis. Her status improves, however, two days before discharge, she begins showing signs of deterioration. She is discharged from the hospital without antibiotics or supplemental oxygen or the results of her blood tests which show an infection. 18 hours later, she is found non-responsive and is rushed to the hospital, where she dies the next day. The autopsy reveals that she died due to sepsis, and plaintiff argues that two days before being released she had signs of infection including fever, high pulse, and extremely low oxygen saturation rates along with trouble staying awake. The jury finds for the plaintiff, awarding her $2,250,000. 2013, Virginia: $1,925,000 Verdict. A female suffers from an untreated spinal epidural abscess, leading to septic shock, and resulting in her placement on a ventilator for the remainder of her life. She argues that the doctors failed to diagnose her epidural abscess and further failed to consult specialists for the treatment of sepsis. The jury awards her $1,925,000. 2008, Virginia: $2,000,000 Verdict. A minor male tells his doctor that he is suffering from a mild brain injury, partial hearing loss, and an infection. The doctor delays in diagnosing the condition as spinal meningitis, resulting in sepsis. The plaintiff alleges the doctor breached the proper standard of care by failing to perform the proper diagnostic tests to rule out sepsis and by failing to order antibiotics or a spinal tap. The plaintiff suffers sepsis, brain damage, cognitive deficits, and permanent hearing loss due to the doctor's failure to provide a proper standard of care. The jury awards him $2,000,000. 2007, Illinois: $5,500,000 Verdict. A 31-year old female dies, after arriving to Northwest Community Hospital complaining of body aches, fever, fatigue, sore throat, congestion, and lethargy. The hospital's staff failed to diagnose and treat her sepsis by failing to perform the proper diagnostic tests, failing to admit her to the hospital, and failing to prevent the progression of sepsis. The hospital and its doctor argue that the patient's parents should have sought medical attention for her earlier. The jury disagrees and awards her $5,500,000. 2006, Nevada: $135,000 Verdict. A male arrives at his primary care doctor, complaining of respiratory problems along with muscle and backaches. About five hours after, he dies. The plaintiff argues that the doctor's failure to perform tests, failure to diagnosis sepsis, and failure to provide the proper standard of care led to his death. The jury awards $135,000. 2006, Pennsylvania: $1,215,000 Verdict. A 26-year old female arrives at the emergency room where the doctor performs several tests before diagnosing her with intoxication from an unknown poison. However, it is later discovered that she actually was suffering from severe sepsis, and she claims that the doctor and hospital failed to diagnose and treat her properly. Plaintiff argues that the hospital's failure to provide the proper standard of care led to her septic shock and death. The jury found the hospital and doctor to each be 50% negligent, awarding her $1,215,000. 1996, Maryland, Baltimore City: $6,200,000 Verdict. A 22-month old boy arrives at Laurel Regional Hospital with scald burns. His condition is deteriorating, and after two days he is transferred to Holy Cross Hospital, where he later dies. He argues that the hospitals failed to properly diagnose the symptoms of sepsis, and failed to treat him with the proper standard of care, while the hospitals argue that sepsis was not a factor in his death. The jury agrees with the plaintiff, awarding him $6,200,000. If you have been harmed or have lost someone you love as the result of a medical error by a doctor or hospital, we can help you. Miller & Zois has a history of success in getting large verdicts and settlements in medical malpractice cases for our clients. Call us today at 800-553-8082 or get a free, no-obligation online case review. There is no cost or fee of any kind for this consultation. We will discuss the best path forward for you to receive compensation for the suffering you have endured. 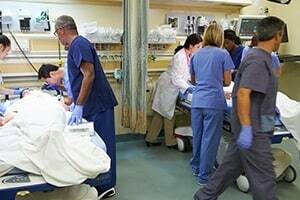 Many sepsis cases are hospital-acquired infections.